Maisy is a jack russell cross Bichon frise. She is now 3 years old. she is a fantastic dog with a hilarious personality. 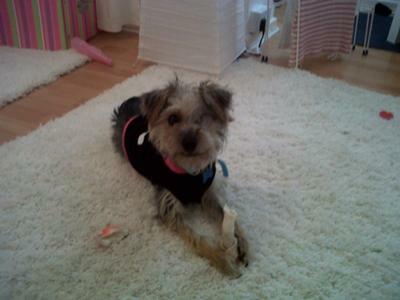 Maisy was knocked down when she was under 1 year old and as a result had to have her left eye removed. This has not held her back, she bounced back to full health and copes fine with one eye. Maisy is my little star!. What a little sweety she is! !